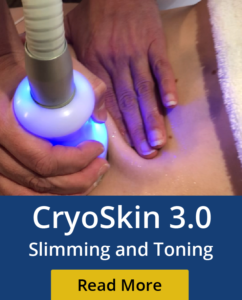 Cryo Shaping is a new, non-invasive way to gently and effectively reduce fat in targeted areas of the body that results in a noticeable,natural-looking fat reduction in the treated areas. What makes the Cryo Shaping procedure different is that it uses advanced cooling technology to selectively target fat bulges and eliminate fat cells through a gradual process that does not harm the surrounding tissues. This procedure can reduce unwanted abdominal fat, love handles (flanks), and back fat. With this non-invasive procedure,there are no needles, no incisions,no need for anesthesia or pain medications,and no recovery time. The Cryo Shaping procedure is comfortable for most patients, they can read, work on their laptop computer, listen to music or just relax. Most patients typically resume their routine activities, including returning to work and exercise regimens on the same day as the procedure. It is now the most popular way to lose fat (targeted areas) in Europe, with a single treatment showing a 26 % reduction in the fat layer. © 2016 - 2019 GoPolar Cryotherapy | All Rights Reserved.